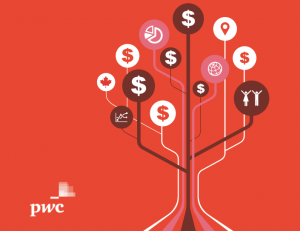 According to CB Insights and PwC’s Canada’s latest MoneyTree report, 2017’s sluggish start may transform into a podium finish by year’s end. 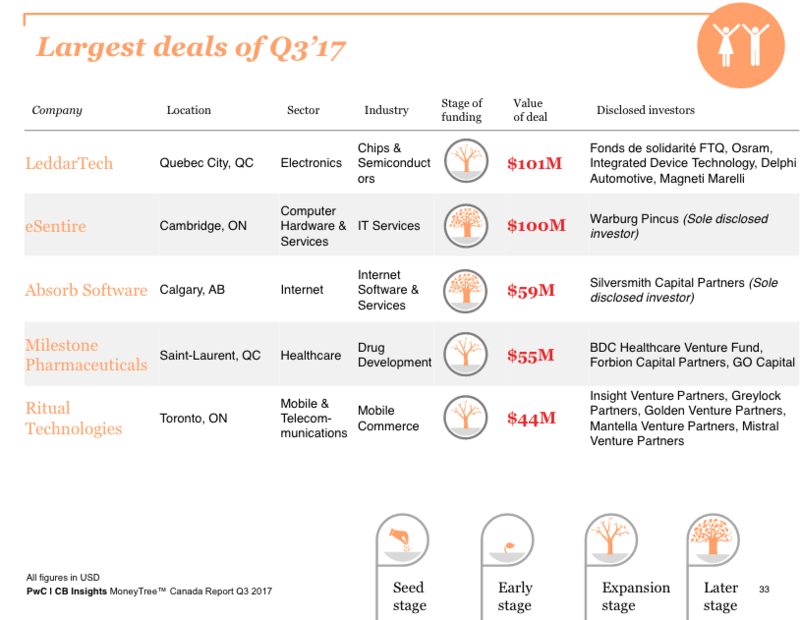 The report, which tracks VC activity in Canada for Q3 2017, indicates that Canada could exceed $2.5 billion ($2 billion USD) across more than 300 deals for the year. The result would match or surpass activity from last year, when a total of $2.2 billion USD was invested, and 2016, which fell just below the $2 billion USD threshold. Current year-to-date financing has already surpassed 2014’s $1.7 billion USD total. Q3 2017 also beat 2016’s biggest quarter in terms of dollars invested. Canadian VC-backed companies received $1 billion ($858 million USD) of total capital in Q3 2017, invested across 81 deals. On a quarterly basis, deals increased by 21 percent, and dollars increased by 110 percent from Q2 17. Q3’s deal total also nearly matched Q4 2016’s eight-quarter high, while surpassing the biggest quarter of 2016 in terms of dollars, driven by a pair of mega-rounds of $100 million USD or more. “Canadian tech had a strong Q3 with a substantial rise in both deal volume and dollars invested. With this momentum, we look forward to a strong close to the year, as we’re on track to surpass $2 billion USD invested,” said Chris Dulny, National Technology Industry Leader at PwC Canada. 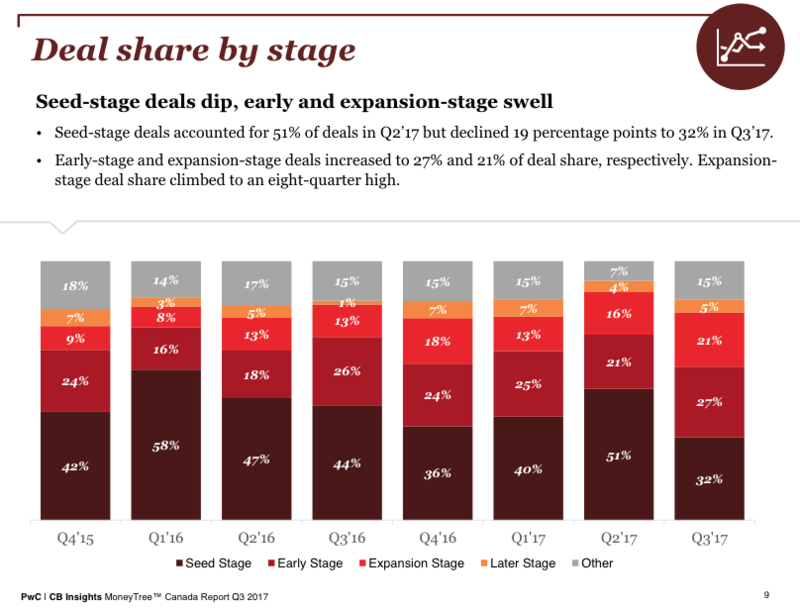 Seed-stage deals accounted for 32 percent of deals in Q3 2017, a 19 percent drop from 51 percent of all deals in Q2 2017. However, early-stage and expansion-stage deals increased to 27 percent and 21 percent of deal share, respectively. Expansion-stage deals climbed to an eight-quarter high in Q3 — a strong contrast from past quarters where seed-stage deals were the most prominent, and perhaps a sign of a more robust investment ecosystem. 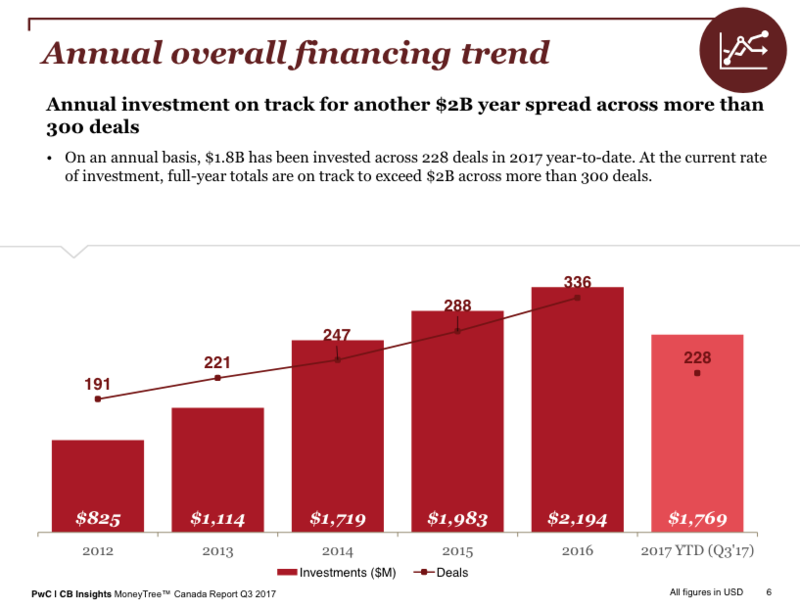 Canada-based investors accounted for 62 percent of all active investors at the seed stage, while also representing over 50 percent in early and expansion-stage deals. While an increase in corporate participation was a major theme of Q2 2017 — 27 percent of all Canadian companies had at least one corporate VC investor during this time — this number dipped to 21 percent this quarter. However, the report indicated some optimism around sustained corporate participation, as corporate investors continue to account for over a fifth of Q3 2017 deal share. 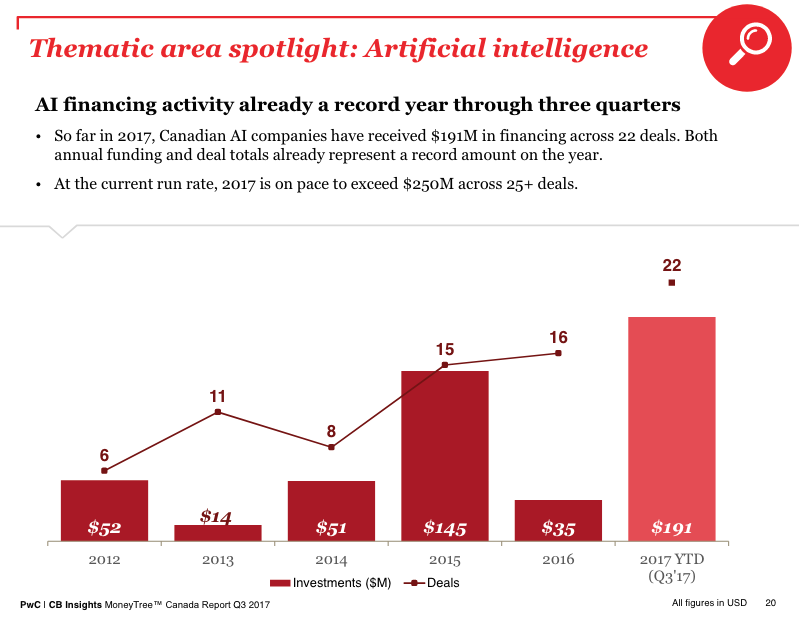 The momentum in AI funding from last year — driven by Element AI’s $137.5 million Series A — appears to continue as Canadian AI companies have received $241 million ($191 million USD) across 22 deals so far in 2017. At the current run rate, 2017 is on pace to exceed $316 million ($250 million USD) across over 25 deals. By province, Ontario had the largest number of deals and dollars, with $569 million ($450 million USD) deployed across 47 deals. Quebec followed with $318 million ($252 million USD) deployed across 18 deals, and British Columbia with $84 million ($67 million USD) across 12 deals. Waterloo-based companies jumped from $13.9 million ($11 million USD) in Q2 17 to $14 million ($112 million USD) this quarter, driven by eSentire’s $100 million USD financing round. Access the full MoneyTree report here. 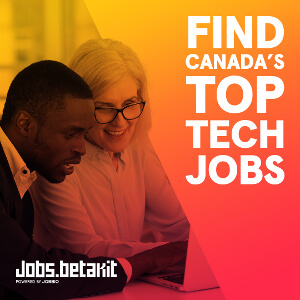 BetaKit is a PwC MoneyTree Canada media partner. 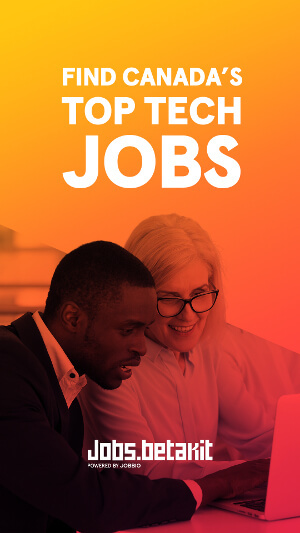 The data in this article is powered by PwC MoneyTree™ Canada, the go-to source for venture capital and high growth startups. 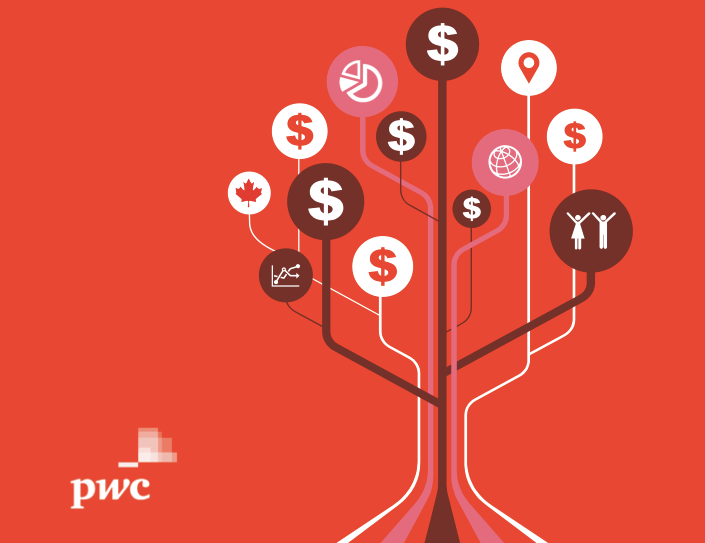 Download the latest MoneyTree Canada report here. Canadian video games are fuelling the nation’s tech innovation. No, really.